When possible I like to take a store bought version of the dressing to compare ingredients. But in this case I could not find a dressing similar enough for comparison. There were some creamy versions, but mine was more like a vinaigrette. I used my food processor, but if you mince up the chipotle pepper very very fine (I guess the definition of mince) you can just whisk everything together. Add everything to processor and mix. 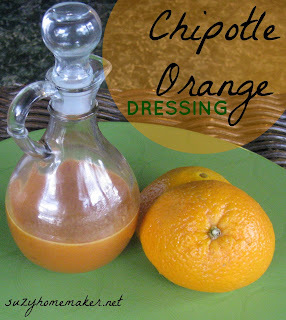 You will get a wonderful orange-colored dressing with flecks of the pepper in it. It was one of the prettier dressings I have made. I paired it with a salad of lettuce, cabbage, tomato, avocado and mango chunks. It was perfect! One of my favorites. I have done a series of homemade dressings, suzyhomemaker sauces, where you can find all of them listed with links.